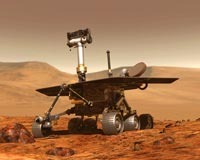 NASA artist's concept of Spirit rover working in the Gusev crater on Mars. Image: NASA/JPL. On January 23, the flight team for NASA's Spirit rover finally received data from the silent robot in a communication session that began at 5:26 a.m. PST and lasted 20 minutes at a data rate of 120 bits per second. Spirit's response was provoked by a JPL command to Spirit at 5:02 PST via the NASA Deep Space Network antenna complex near Madrid, Spain, telling Spirit to begin transmitting about its problems.